Paul and Barnabas were both first century apostles but not among the original twelve disciples. Barnabas was a Jew from Cyprus and was an early convert to Christianity. Paul was born Saul, a Jew, in Tarsus (Asia Minor), and as a Pharisee, he made it his job to persecute Christians. He was present at the stoning of Stephen, the first martyr. Then on the road to Damascus, he was blinded by a flash of light, which was a vision of Christ. He was called to preach Christianity to the Gentiles, but at first the Christian community did not trust him. It was Barnabas who accepted him and introduced him to the other apostles. Paul and Barnabas became tireless missionaries. They undertook the first Christian mission together, which began in Cyprus and took them to Asia Minor and Greece as well. 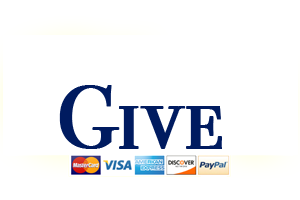 After many journeys, Barnabas returned to Cyprus and evangelized there. Legend says he was martyred in Salamis in 61 C.E. Paul spent time without Barnabas in Ephesus, Macedonia and Achaia, but when he returned to Jerusalem, he was imprisoned by angry Jews for supposedly breaking Jewish laws. Paul claimed he was keeping faith with the old laws and demanded a trial in Rome. He was entitled to this because he was a Roman citizen. He was apparently acquitted, and legend has him traveling as far away as Spain. He was supposedly martyred in Rome on the same day as Peter, but because he was a Roman citizen, he was executed by sword and not by crucifixion. His epistles are the basis of much of Christian theology, and there are several apocryphal gospels and Acts of Paul which enjoyed wide popularity. 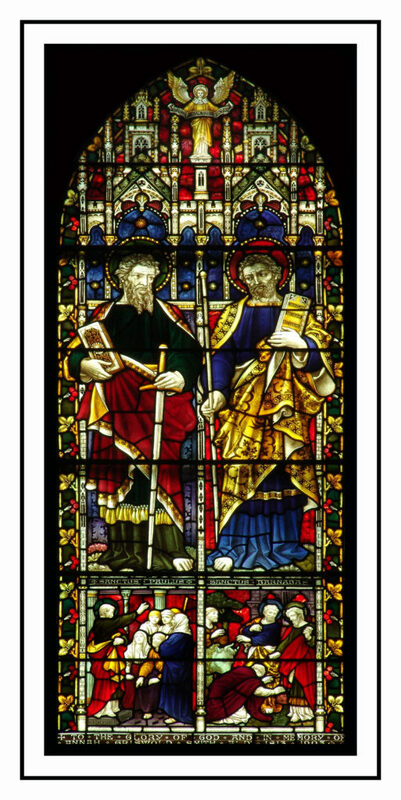 In this window, both Paul and Barnabas are holding books, Paul’s symbolizing his writing, and Barnabas’s reflecting his preaching of the gospel. Paul carries a sword representing his martyrdom, and Barnabas holds the staff of a pilgrim missionary. The window was given to St. John’s in 1903 by Mr. and Mrs. William D. Smith and their daughter in honor of Mr. Smith’s mother, Annah Griswold Smith. This window is located on the south side of the nave, in the clerestory level, first window below the transept. The inscription of dedication reads: To the Glory of God and in Memory of Annah Griswald Smith, A.D. 1813-1903. Inscription: To the Glory of God and in Memory of Annah Griswald Smith, A.D. 1813-1903.